This is a two-week schedule of activities to teach students about what causes day and night and to compare and contrast the Sun, Earth, and our moon (Unit 8). The majority of the activities themselves can be found in the Texas Science Mega Bundle or on my personal website. This is my planning guide based on 5 days a week with 60-70 minute departmentalized classes. Every campus, teacher, class, and student is different, so trust your professional judgment when planning for your students. 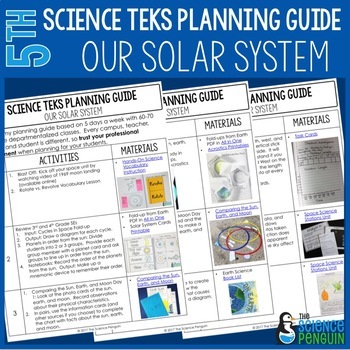 Are you interested in a special Mega Bundle with the resources you need for the 5th grade science TEKS? Click to see the Mega Bundle! NOTE: At this time, I am only able to keep up with these planning guides for the 5th grade science TEKS. I plan to make more for the other 5th grade science TEKS units.